Here are my "five easy ways" which I talk about on the video. So this is a summary, but there's more if you listen to it. Relax and get some exercise – de-stressing is good! Do the washing up. People say they have their “best ideas in the shower.” It is through doing repetitive activities that we help this happen. Enjoy spending time with friends and family. Use some of this time to talk through your ideals and problems. Listen to what other people have to say about your strengths. This is the final part of my interview on Radio Swindon 105.5 on 13th December It is 5 minutes long. If you prefer you can listen to the whole 29 minutes audio: streaming or download. People who run their own business often find it a challenge to delegate work to improve the efficiency of their business. It takes trust and confidence to delegate work. It takes time to find the right people. It can be difficult to let go of control. As a business owner one of the things I value about business networking groups is the opportunity to get to know people who may help my business grow (and not only people who I hope may buy my services). Regular groups I attend include weekly BNI in Melksham, and a monthly meeting in Bristol organised by Lloyds Bank. Both of these healthily combine good structures to help conversations to take place and informal friendliness. This morning I enjoyed the Bristol breakfast all the more because I met two great business owners who provide services at no additional cost. Did I say "free?" This is a dream for people wanting to delegate! Gemma Lyle of The Main Event Management Company will find venues ranging from conference rooms for formal meetings through to overnight accommodation for busy business travellers. She knows where to look to find good services at reduced cost. Because such an agency works on a commission basis, she can reduce the cost of my bookings without charging me anything. Good news! Would you believe that you can post your letters for less than the cost of a stamp? This kind of facility is usually only available to large firms doing bulk mailing. However I really like the niche that Nevil Horne of Mailadoc has found. He will save you and your staff time by receiving documents electronically and then printing and posting them. These could be anything from invoices to sales litereature. Again, because of the discounts he receives, this service can cost you less than if you walked to the Post Office yourself. Amazing, and all of these contacts for the price of an impressive Full English Breakfast! I’ve been invited on to Swindon Radio 105.5 this evening (Monday 13th December) to talk about how individuals and businesses can cope and move on in the current financial climate, and how coaching can help with that. This is the 6:00 p.m. slot which is hosted by the Federation of Small Business. I’ll be on from 6:00 until about 7:00 - and there’s music as well. I enjoyed the Institute of Business Consulting Christmas get-together in Bristol today. Apart from good food (breakfast and lunch) we enjoyed two great speakers. Malcolm Lewis spoke about success in organisations, and shared many useful models. Patrick W Jordan, who is a psychologist, spoke of his research in drawing the key principles of success out of many people's writing and research on the subject. His principles don't just apply to those areas where we think of ourselves as needing to be successful, but to happiness and fulfilment in work and life in general. For an expanded summary of The Principles of Success, see later article. Last night's event at the new Jury's Inn was a great success. 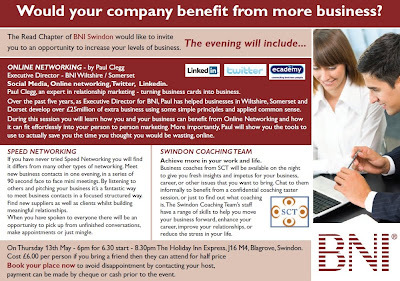 I like the way that with the Swindon Coaching Team we can partner with Swindon Connections to hold regular events at different Swindon venues. This gives us a way of keeping in touch with our colleagues, clients, and friends as well as meeting and encouraging others who run their own businesses. I think that all those we met last night benefitted from conversations with us about coaching and also made new business contacts. Maybe it's worth coming along just for the speakers. Last night Warren had arranged for Josie Payne to speak about Emotional Intelligence. I'm not used to people showing videos of Mike Tyson biting an ear off during a boxing match (it belonged to Evander Holyfield) but then this was one of the clearest talks I've heard on Emotional Intelligence. Josie spoke of the challenges of controlling our emotions when we are under stress in a way that we could relate to and apply straight away. Her own interest in the subject flowed from her experience of being on an aeroplane that was hijacked. I recommend giving Swindon Connections events a go, and I'll publish future dates. Get in touch with me if you'd like support with your own business, career, or life issues - whether or not you have ever bitten off someone's ear. Use the Christmas holiday to start the new year with fresh enthusiasm and a clear sense of direction. Free taster sessions are a great gift - why not ask me for one for yourself or a friend? 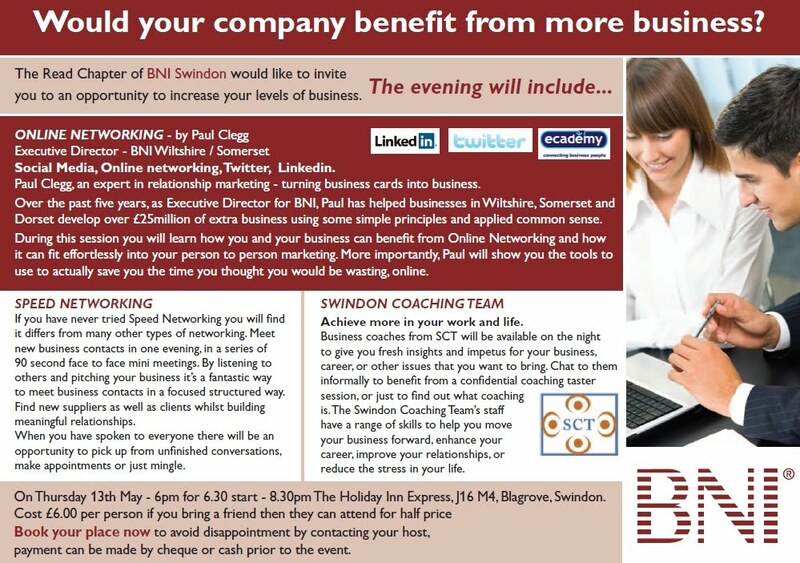 Richard will be attending the next Swindon Connections event at Jury's Inn, Swindon, on Thursday 25th November with the Swindon Coaching Team. As usual it's an opportunity to meet our coaches and to gain new perspectives and solutions on your current issues with some of us. We're continuing to give out vouchers for free coaching taster sessions. In addition, there will be an opportunity to meet exhibitors at this Business Scene event, and the speaker that evening will be Josie Payne talking about Emotional Intelligence from an unusual angle. So, make a it a date. Start time is 6:00 p.m., ends at 8:30 p.m., and refreshments including a light buffet will be provided - so the £10 ticket is good value. For best results, book in online. See you there! Full details, location, and booking form here. It's good to be a Wiltshire Business! that started trading after 25th September 2009. Enter now! Support and publicity even if you don't win! It's good to be a British Business! If you'd like some encouragement, take a look at the latest (November 2010) issue of Management Today. It has a focus on British Business, and some things are going well! The section that I like best contains positive comments about British business by leaders from other countries. Take a look at the article (Home thoughts from abroad)! When the Government announce cut backs, as it has for Business Support, what avoiding action can you take, if you run a business or charity? If have not already received this grant, I encourage you to apply to me now for the coaching of your business leaders: for example for you or for a newly promoted director. All of these bring benefits to the organisation too: increased productivity and quality of work, improved staff satisfaction/morale/retention, better quality of customer service, and so better bottom-line results. There are eligibility criteria which I can talk through with you. The grant is mainly for firms of 5 to 250 staff. However at times funds are available for smaller firms; and eligibility for charities take into account volunteers too. To find out more, phone me or email. Once upon a time, perhaps when you were a lot younger(! ), did you join a new team and expect it to be 'plain sailing' only to discover that meetings sometimes got unpleasantly aggressive or argumentative? It's probably happened to all of us - I mean both the optimism and the contact with reality. Joining or forming a team (or group or committee) that has a job to do isn't easy. The classic view of this is that newly formed teams go through a process of forming, storming, norming, performing. Here's my executive summary. Team members look for clarity of purpose and direction, looking to the appointed leader for these things if there is one. Members seek to get to know one another. A power struggle develops as people jockey for influence and seek to get to grips with how to achieve results. People push against boundaries; factions can form; relationships are strained; people can become disillusioned. The team starts to come through the period of trial, relationships are strengthened, and the team starts to agree on ways of doing things. A lighter style of leadership is needed, but the leader still needs to encourage the development of good relationships. With relationships formed, working processes in place, and a healthy clarity of purpose, the team grows to handle difficulties in a united way and to deliver results. Sigh with relief! Why do I write about this now? Firstly, most people are in teams of some sort. When we are embroiled in the day to day challenges we can lose sight of the big picture - which is about the process of building the team as well as delivering results. It is about relationships as well as tasks. We can helpfully 'step back' to encourage ourselves that even if 'storming' is happening our team is probably developing as it should. We can remind ourselves that we can use our strengths to help it to grow and thrive. Much talk about teams, such as this forming, storming, norming, performing, seems to imagine that the membership of teams stays constant. However new people join, and the process of helping them to join and get involved is often not handled well. The new recruit goes through their personal process of forming, storming, norming, and performing. There are other lenses through which to look at a team's progress, too. The perception that a challenge is taking place, and that it is excessive, may also have to do with the personalities of the group (I think in the way in which Myers Briggs or Insights® Discovery describe personality) or to do with wildly different attitudes to conflict. Simply, some people believe and behave as if disagreement should be buried because it causes damage, whereas other people believe that disagreement is best brought to the surface immediately. A 'middle way' is not the right answer to all problems in life: sometimes it is good to have a range of approaches. However with attidudes to conflict an awareness of one's preferences and the ability to choose together to adopt a 'middle way' is really helpful. This understanding is relevant to my mediation work as well as team development. If you are in a stormy team, step back. Look for encouraging signs that the team is developing, and ask yourself how you can contribute constructively. If this is difficult, one of our coaches can help you and your team to step back to celebrate what is going well and see what can be improved. Coaching is always great for stepping back from issues to see them objectively and recognise fresh perspectives and ways of doing things. How would that be helpful for you? I'd be delighted to hear your stories and examples to do with teams. Add your comments! If you'd like to read more indepth articles like this, subscribe here. If there are things I've touched on here that you'd like to learn more about, get in touch. How was the launch? It was great to see so many people there, including sponsors who have made this competition possible. Being driven round Castle Combe circuit by an experienced driver with commentary on his every move, and sometimes on three wheels, was an unforgettable experience. Do I ever get queasy in the back of a car? 3 km circuit twice at max 115 mph - seemed over quite quickly! Here's a reminder about the competition: businesses started in Wiltshire between 25the September 2009 and 31st August 2011 are eligible for the 2010 competition. Details and entry form from Wessex Association of Chambers of Commerce 01225 355553. I was pleased to attend a networking breakfast in Chippenham this morning, organised by Monahans Accountants, where Duncan Hames had been invited to speak about his experience of his first few months of being an MP. He is the Lib Dem MP for our constituency and he is new to the job. As he said, building empathy well with his audience, becoming an MP is in many ways similar to starting a business (for example because a new staff team has to be built). It was good to meet him again, to chat about the importance of continuing with those parts of government support for business that are going well and to hear his commitment to ongoing support for business, and to hear his talk. I was impressed that he spoke for some while without notes. He did so in an interesting and cogent way which put across well his understanding of key issues for our country, and the perspectives that need to drive current strategy for the economy. I was interested in his comment along the lines that the government do not create jobs through employment in the public sector, because the money to pay for those jobs is always financed by the public sector. Therefore job creation has to be done by private sector businesses (his audience this morning) and government have to foster that. There were entertaining stories too of his first few months in office. I'm in the business of helping people to find work in which they will thrive, and to thrive in the work that they do. So I was pleased and moved to see our new MP getting to grips with his new role and relating so well to his audience of constituents. It's never easy starting a new job, particularly a high-profile public one (do MP's have coaches?!) so all the best to him. People seem to want to be cheerful all the time, and I suspect that tv presenters would be sacked if they did not have a cheery smile on their faces all the time - even when reading news items about disasters such as the recent floods in Pakistan. People can find it difficult to empathise with people going through difficult times, and we just hear, "Cheer up!" It is good to feel happy, yet there are times when people need to grieve, times when we need to listen and empathise not just to try to cheer people up, whether this is in work as a coach or just conversation with friends. We need to be real and accept people's emotions and help them journey through them not deny them. So, I find this article by Mary Kenny in the BBC magazine encouraging, as she writes more about how in British society we may have lost sight of the importance of timely grief and mourning! If you've never been to the National Self-Build & Renovation Centre in Swindon you've missed a treat. It's an Aladdin's Cave of information and displays on how to renovate or build your own home. They even run courses. In the middle of this vast warehouse is a Show Home, and our Swindon Coaching Team networking evening (c/o Swindon Connections) took place in this. So it was very comfortable, and lent itself well to enjoyable and relaxed conversation over good drinks and nibbles. All this builds the SCT vision of increased availability of good coaching for organisations based in or near Swindon, in tune with Finding True North. We were offering free coaching taster sessions. If you'd be interested in one, email me or phone me on 01249 712446. I've enjoyed starting work as a result of a further invitation from the Wiltshire Wildlife Trust to offer leadership training. On this occasion the training comprises a series of sessions for staff newly promoted to line management positions. I'm using a mixture of teaching input and coaching to provide apppropriate theory and practice and to help to embed the learning and equip them for their new roles. Lately I've been meeting people whose jobs are coming to an end prematurely through redundancy or retirement. They are looking for new work, and are wanting to work through what their skills and interests are and what work they might do instead of just looking for "more of the same." I'd like to recommend the one workbook that I've found to be most helpful. It guides the reader through analysis of their interests, skills, values, and the kind of work they enjoy; helps them to map these to possible job choices; and provides support for problems along the way. It is also great for young people starting work for the first time. Some people are happy working through such a process on their own, other people prefer accompaniment on the journey. As a coach I can provide that. Now in its 4th edition (2009), it is Build Your Own Rainbow - a workbook for career and life management - by Barrie Hopson and Mike Scally and published by Lifeskills international. There are other books out there too: this is my favourite. You are welcome to add your suggestions as comments to this blog! You may want to support your local bookshop, however here's the Amazon link. We had an animated meeting of Corsham Chamber of Commerce this morning. The Corsham area continues to grow economically. Amongst other things the Ministry of Defence sites continue to expand, and and the Methuen Arms Hotel is due to reopen shortly. Ian Storey announced his resignation as President, after more years service than I can remember, and we continue to encourage more people and businesses to enjoy membership of the Chamber and work towards developing our local economy. I am excited to read that the MBA from Cranfield School of Management has been ranked #1 in the UK in a recent survey by The Economist of worldwide full-time MBA courses in 2010. This also places the school 4th in Europe and 15th in the world. I did my MBA there from 1983 to 1984. It's good to see continued improvement! I'm part of the Well Being Group in Salisbury Diocese (Church of England). I attended one of their regular meetings yesterday. We're concerned with making good provision of support for church ministers through coaching, mentoring, spirtual direction, sailing... (you name it!). It's a challenging time for the Church of England at the moment. There's a big culture change that we're seeking to implement, partly driven by government legislation. This changes the way that dioceses have to relate to and support clergy - in a way that is closer to a conventional employment relationship. Procedures have to be tightened up, and as always with imposed change there is an opportunity to make the most of it to improve both results and the well being of staff. Swindon Coaching Team continues to attend popular places and events to give people an opportunity to find out how they may benefit from coaching and experience a taster session. If you'd like to offer us a venue, perhaps so your employees may benefit from free coaching during their lunch hour, then get in touch. Wednesday 22nd September at the Swindon Connections meeting in the National Self-Build Centre in Swindon from 6:00pm to 8:30pm. Cost is £10+VAT which includes light refreshments: for venue and to book go to event page. Those of you who attended the last one of these in July will know the added benefit of great networking and good visiting speakers. On Wednesday 29th September we are doing a lunch time drop in event again at the popular Old Bank wine bar in Wood Street Swindon SN1 4AB between 12 noon and 2pm. Drop in anytime. No need to book, and no cost except the drinks you buy! Hope to see you there: let me know if you're coming! How about a painted portrait as a special gift, or to brighten up your offices? Take a look at this new site: Steph Hovey Portrait Artist. Many of my coaching business clients receive grants of hundreds of pounds from Train to Gain's Leadership and Management Advisory Service, because the coaching helps them to develop leadership skills. I was pleased to be invited to a gathering of Train to Gain's advisers in Swindon this week, to meet up, share information, and help develop this service. The advisers stay in touch with the firms they have helped, so it was encouraging to discover that they had received good feedback about the coaching Finding True North has given, and wanted to connect me with further clients. For some while I've been aware that The Prince's Trust offer training and mentoring for young people (age 18-30) who want to start their own business. Today I met with some of the team at their well-staffed offices for their South West Region, in Bristol, as I have been considering offering to do some mentoring for them. I'm glad it's taken me a while to get round to this, because last year they redeveloped their services to give better support to those who are seeking to set up a business, and to expand their services to help others to develop the skills needed for employment or further education. So the line up now is impressive. The Enterprise Programme for those aged 18 to 30 provides an initial four day course on how to start a business and then supports the participants over up to twelve months as they seek to develop a business plan and consider whether to start a business. Some financial support may be given. Mentors are available for ongoing support for 6 months to 2 years whether the young people choose to start a business or not. Alongside this there are other programmes to develop skills and confidence in young people aged 14 to 25. Some of these are based around adventure training, some are based in schools, and some teach vocational skills. Very impressive. People interested in supporting The Prince's Trust can volunteer, give money, or even join their South West Leadership Group. Attending business breakfasts is useful. I hear that from April 2012 the government is introducing a compulsory pension scheme for employees called NEST. Employees will be automatically enrolled unless they opt out. Employees will have to contribute 4% of salary, and employers 3%. I've felt for some while that the situation to do with employee pensions has been confused. So I think it's good news that the new government is going ahead with plans from the last administration, although I can see the agenda of the govenment wanting to reduce dependency on state pensions! Statistics also tell us that the times when people are most likely to set up their own business are at the start of their career, or around age 50 when either they have reached a peak in their employed career or they feel more freedom as domestic commitments reduce. It is likely that more people will be considering starting their own business as a way of escaping from unemployment. You can also receive posts like this in your inbox, and sign up to our occasional newsletter which contains more detailed articles about running a business and career development. I'm amazed by the array of different quotes I read from Albert Einstein. Anyone would think he spent his whole time creating them! Here's a good one. The only sure way to avoid mistakes is to have no new ideas. Maybe this is where the NLP dictum came from: there's no such thing as failure, only learning. Ever since I met Aida, people have been delighted when I've introduced her to them. I think it's because everyone likes the idea of being more interesting, of gaining more interest or influence, when they create publicity material or write persuasive emails. AIDA may sound like a memorable girl's name, however it's a formula for those who seek to be persuasive. It's been wisely used for many years, and you can use AIDA for written publicity, emails, or even sales conversations. People don't always listen. You need to gain their attention. Use a heading or opening sentence that will make people stops in their tracks. Follow this with a few lines that will interest them, because you need to draw them in to what you want to say so that they want will want to read on. This may be some key facts, or an important question. You want someone to do something, so you need to build this desire in the text that follows. Whether you are writing sales literature, or want a friend to come on holiday with you, you need to show the benefits. "What's in it for me?" Finally, "ask for the order." What do you want the person to do? Marketing experts, and web page designers, all agree that we should keep in simple: ask for just one action because people like to be told what to do, but don't like too many choices. Have you read this far? You're more than interested, and you can see some area where you'd like to improve the effectiveness of what you say or write. Give it a go! How will you apply AIDA first? Share this with your friends! Click on the buttons below. I'd like you to experience the benefits of AIDA, so I hope you enjoy putting these things into practice. Let me know how you get on, and comments on my articles are always welcome. People tend to thing of AIDA as being of use for written publicity, but you can apply it to sales conversations too, starting with those initial few seconds you have to create a first impression and attract attention. If you struggle to remember the acronym, you could think of Verdi's opera Aida, or that the word means "visitor" or "returning" in Arabic - whatever helps, really! I won the speaker's prize at our breakfast meeting on Friday (BNI in Melksham). It was a CD of Leonie Harrison, an impressive female vocalist. Quite a few of my clients have benefitted from a grant of up to £1000 from Train to Gain (their Leadership and Management Advisory Service) to help develop their leadership skills. It's great! So I was pleased this week when they asked me to visit a partner in an accountancy practice in Swindon with a view to providing coaching. However we scope the coaching, the grant will help them develop as a practice. More on Train to Gain grants here. Don't hang about: the scheme has less than a year to run now. When I started this business in 2007, I thought I'd hold off VAT registration until it became clear whether most of my clients were businesses, charities, or individuals - i.e. whether they could reclaim VAT. There is some sense in that. Now, most of my clients are businesses who are registered for VAT, although it's still important to have a pricing strategy that is appropriate for all my clients. I've just looked at the amount of VAT I've paid ("input tax") since I started my business, and it's frightening. I can feel online VAT registration coming up. If you want to learn from my mistakes, get in touch! I sometimes wonder whether I am really a Quaker at heart. I like the way that they value, use, and are comfortable with silence. I like the way that they like to think things through rigorously and seek to live in a principled way. I like the way that they seek to make decisions by consensus and give those who disagree, but do not want to get in the way of a majority decision, the ability to "stand aside." So I read with interest a recent article, written in the light of the likely takeover of Cadbury in the UK, called "The Quaker Brand. "* Cadbury was one of a number of businesses set up by British Quakers in the 19th Century. The Quakers were keen to provide good working conditions for their staff, and a visit to their Bournville site in Birmingham is fascinating - and not just for the opportunity to eat lots of chocolate! What interested me particularly in the article was that the reason that the Quakers became such good businessmen was because, being outside the Anglican Church, they were banned from universities (until the middle of the 19th centrury). This effectively excluded them from careers in law, science, or medicine - and of course their pacifism excluded service in the armed forces. There was also good networking within their religious community. These developments resonate with the Jew's dominance of financial activity in Europe in earlier centuries due to their exclusion. It is interesting to see the way in which the closing of doors to certain activity can shape whole communities in a way that brings benefit, although it can be (very) painful at the time. Every moment we have to make choices. You're in a meeting and your mobile phone rings - do you answer it? Our time management has "failed again" and we get to the end of the day with work not complete - what to do? Here's some key areas, following on from my Time Management Tips. Avoid major decisions when you're not in a good state - we don't make decisions well when we are grieving or very stressed, and drugs and alcohol may not help either! Finding True North are collaborating with Unlimited Potential's team of coaches, as a way of providing increased coaching to a wider range of clients. Unlimited Potential have offices in the UK in London, Tunbridge Wells, and Kettering. Using time well always seems to be a challenge. Here are some new hot tips on our web site. Sometimes I find myself encouraging people to "go with the flow" - that is to notice and respond to the way that life seems to be leading them. So I was challenged by the quote below which I saw prettily painted on the side of a canal boat on the Kennet and Avon Canal recently. Happy New Year to all our readers. We wish you a prosperous 2010.